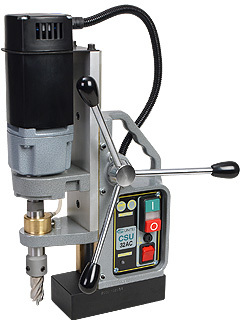 Portable Magnetic Drills – CSU 32AC | Advance Drills Inc.
Best power-to-weight performance in the industry – holes up to 1-1/4″ dia. Model CSU 32AC is lightweight and portable, and has the best power-to-weight performance in the industry. Automatic cooling/lubrication system is built into the arbor. • Lightweight and portable at only 24 lbs. • High-density dual-coil magnet has holding strength of 3080 lbs. Model CSU 32RL has a variable-speed (100-450 RPM), reversible motor for tapping up to 3/4″. Twist Drill Capacity: 1/2″ dia. Magnetic Force (1″ Plate): 3080 lbs. With a 1/2″ chuck (Part No. 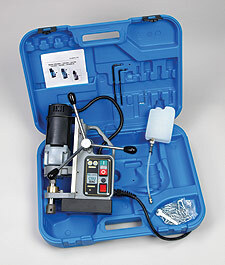 IBC 17), these models easily convert to standard drill presses with a 7-1/2″ stroke for conventional twist drills.